Serves 2 if eaten on its own with rice. First, you need to make the roasted curry powder. Although this might seem like a faff, you end up with a small jar that can be used quickly for other curries, and roasting spices does bring a different flavour note. If you have a small grinder, e.g. a spice or coffee grinder, that makes it a lot easier. To make the powder, roast the rice in a dry frying pan for a few minutes until it starts to go brown. Then add everything else and roast for 3-5 mins, until they go darker in colour but before they burn. You need to stand by the stove for this as they can turn very quickly! Either blitz everything in a grinder, or crush with a pestle and mortar. Push through a sieve into a small jar. That's your curry powder. Mix the courgettes with a large pinch of salt and the chilli powder. Set aside. In a large pan, heat the coconut oil, then add the mustard and fennel seeds. Cook until they pop. Add the curry leaves and stir. Add the onion and garlic and cook for a few minutes, until the onion starts to brown. Add the curry powder and cook for a few more minutes. Add the tomatoes, stir, and cook for a few more minutes until they release their juice. Add the courgettes, a pinch of salt, and stir. Add the coconut milk, stir, cover and cook for about 5 mins. The courgette should still retain some bite. Taste and adjust seasoning. 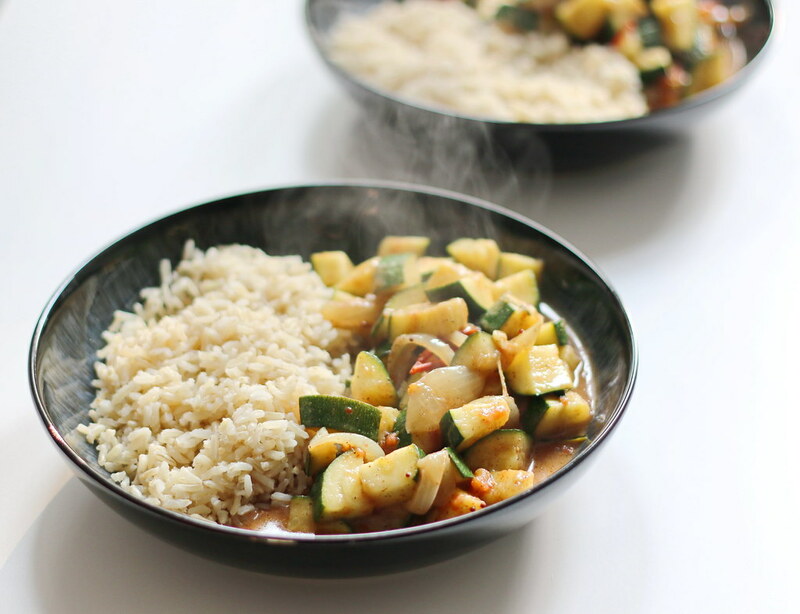 This curry can be eaten with rice or naan, and could easily be served with other curries.